Combined heat and power (CHP), also referred to as cogeneration, is a technology that simultaneously produces heat and electricity from a single source of fuel such as biomass, natural gas, biogas, coal, or waste heat. A new study on the global combined heat and power generation installation market has been announced by U.S. based market research firm Transparency Market Research.The report, titled “Combined Heat And Power Installation Market - Global Industry Analysis, Size, Share, Growth, Trends and Forecast, 2012 - 2018”, states that CHPs had a collective global capacity of more than 452.9 GW through numerous installations across the globe in 2011. By 2018, the CHP installations all over the world are projected to produce 1,219.1 GW of power, a year-on-year increase of 15.3% between 2011 and 2018. Revenue-wise, the market is expected to rise at a CAGR of 11.7% between 2012 and 2018. The report states that the global market for CHP installations is observing a commendable thrust owing to a favorable regulatory scenario, abundant natural gas availability at competitive prices, and an increased scope of applications in the global market. However, the highly capital-intensive nature of CHP installation and the considerable risk associated with the overall process of installation and usage of the technique could hamper the market’s growth in the near future. Another significant threat for the market is the varying nature of interconnection standards between utilities and CHP systems, which makes the manufacturing of components and their installation a costly and complex matter.The report states that the market observed its highest share of demand, over 67% of the overall demand, from the industrial applications sector in 2011. Installations of CHP systems are increasing rapidly in the commercial sector as well. The report states that CHP installations in the commercial sector will increase at a 15.9% CAGR over the report’s forecast. CHP systems are available in the market in a variety of forms, including small scale, micro scale, and large scale CHPs. Of these, large scale CHPs were installed in the largest volume in 2011, making up an 82.5% share of CHPs installed in that particular year. 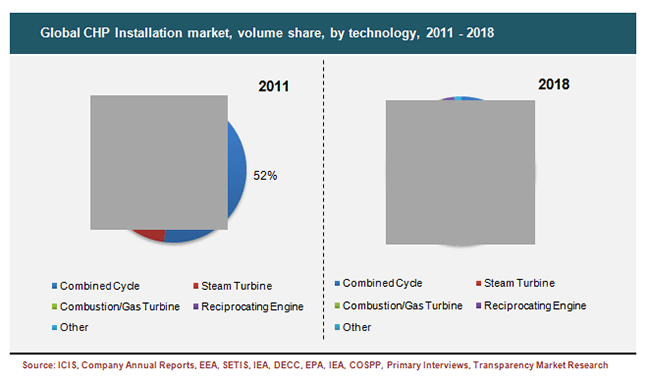 Of the key enabling technologies for CHPs, CHPs based on combined cycle turbine had the largest volume of consumption, an estimated 52% of CHPs installed in 2011. Demand for steam- and combustion/gas turbine-based CHPs is expected to increase at CAGRs of 14.9% and 16.0%, respectively, over the report’s forecast period. Europe accounted for the highest share of CHPs installed globally - over 50% of the overall installed capacity in 2011. Europe is expected to remain the largest trader of CHPs over the report’s forecast period as well, primarily owing to rising demand from the industrial, residential, and commercial sectors. Over the report’s forecast, the market for CHP installations is expected to increase substantially in the Asia-Pacific region, at an estimated CAGR of 15.7%.